Born in Southern California, David discovered his penchant for a tune at the young age of eleven playing acoustic guitar in a youth folk group. His formal introduction to jazz came from his well respected high school jazz teacher, pianist, composer and arranger, Jack Kunz in the suburbs of Seattle. Of those initial introductions, David says "I've been very blessed being surrounded by some of the most talented people and this was true of Jack. He was tough, demanding and taught me how to swing. I did listen to all the great Motown, disco and a lot of cool 80's bands, but found that the rhythm of a swing tune, the sensitive lyrics of a ballad and the colorful harmonies found in jazz really spoke to me." David's continued enthusiasm led him to Cornish College of the Arts where he met internationally renowned vocalist Jay Clayton and others who encouraged him to nurture his natural gifts. 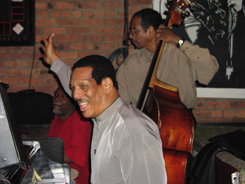 A move to New York's Greenwich Village found David at the epicenter of jazz. He remembers, "It was scary but fun moving to New York. I didn't know anyone but felt quite at home at the many jazz haunts that were right outside by door. Old timers like the late Al Bundy, who played piano at Arthur's Tavern for thirty years, would always invite me up to sing. I became part of a big jazz family that made me feel as if I belonged. As a result, I've met many of New York's finest vocalists and musicians. David would regularly frequent such popular spots as the Five Oaks, The Village Gate and Smalls, Judy's and Birdland. "I've been lucky enough to work with some incredible musicians and meet some great people like the late Laurel Watson who sang with many groups including the Basie and Ellington bands. My dear friend Laurel used to come by every week to do some tunes with my band and always offered words of encouragement, telling me to keep that great swing feel alive. Dakota Staton is another who came to visit on several occasions and would sit in with the band and do some of her great signature tunes. Her mere presence was inspiring, she taught me a great deal." David cites such influences as: Mel Torme'. Chet Baker, Sarah Vaughn, Ernestine Anderson, Dakota Staton and Ella Fitzgerald. David says, "I wholly appreciate what each of these great pioneers can bring to a tune. Ernestine's soulfulness, Mel's agility, Chet's simplicity, Sarah's texture, Dakota's musicianship and Ella (for all the above). He has had the pleasure of working with some of the greatest musicians around including Dena DeRose, Benny Powell, Patience Higgins, Claire Daly, Christos Rafalides, Dr. Dwight Dickerson, Harry Witaker, Virginia Mayhew, Chris Bergson, Harold Ously, Cliff Barbaro, Fukushi Tainaka, Bob Cunningham, Marcus McLaurine, Ron McClure, James Zollar and Danny Mixon just to name a few. 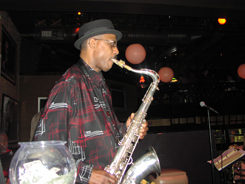 Today, David performs every Sunday at his home base, Garage Restaurant and is now booking jazz for the same room he has been performing since 1996. Coss continues to refine and develop his skills as a vocalist, arranger and producer by continuing collaborations with many of today's new and venerable talent. By having a continuous gig, he has been able to not only learn, but how to grow, develop his own style and a distinctive confidence when interpreting a song. These five clips from David's CD are absolutely mesmerizing. "San Francisco Is Waiting for You", "I'll See You Again", "Another Start", "I Miss You", "Teardrops From Your Eyes", "Live For Now". If you are a romantic person, then this CD is for you. And if you're not, these songs will make you one. 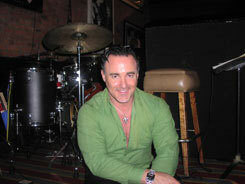 Click below to watch videos of Dave Coss performing. Head on down to The Garage, gas up. I guarantee that the Jazz will pick you up.